Arthur Penhaligon is not supposed to be a hero. He is, in fact, supposed to die an early death. But then he is saved by a key shaped like the minute hand of a clock. Arthur is safe - but his world is not. Along with the key comes a plague brought by bizarre creatures from another... read full description below. Arthur Penhaligon is not supposed to be a hero. He is, in fact, supposed to die an early death. But then he is saved by a key shaped like the minute hand of a clock. Arthur is safe - but his world is not. Along with the key comes a plague brought by bizarre creatures from another realm. A stranger named Mister Monday, his avenging messengers with blood-stained wings, and an army of dog-faced Fetchers will stop at nothing to get the key back - even if it means destroying Arthur and everything around him. Desperate, Arthur ventures into a mysterious house - a house that only he can see. It is in this house that Arthur must unravel the secrets of the key - and discover his true fate. 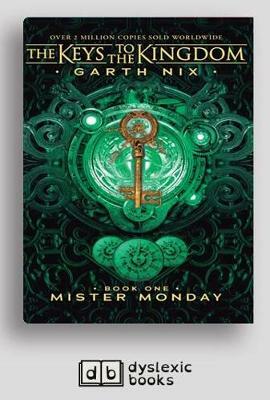 Mister Monday is the first book in The Keys to the Kingdom series.